Twice a year Willis has a Book Fair where the students make their "wish list" and then "shop" for their books. Several times a year School Box Tops and Campbell's Soup Labels are collected and are redeemed for cash for Willis. Once a month (typically the 1st Wed of the month), Willis has a Dress Down Day to raise money for our Fifth Graders, where students can pay $2/month in exchange for wearing non-uniform attire. Participation is voluntary and the student's attire must comply with Manatee County's dress policy. Once a year Willis students from all grades are divided up into four teams to participate in various games for a day. The team that accumulates the most points have "bragging" rights for the year and their team's picture and color is displayed on a plaque in the Cafetorium. Four times a school year, students are recognized in a special awards assembly for demonstrating the Eight (8) Keys of Excellence.the Eight (8) Keys of Excellence. At this assembly the student is given the "Gecko Magnet" and certificates from Red Elephant, Geckos, Chilis, Square One, and Jimmy Johns as awards. Parents are notified via a letter sent home in your students backpack when your student has been selected. Once a year students can purchase a gecko to paint one evening in the Cafetorium. 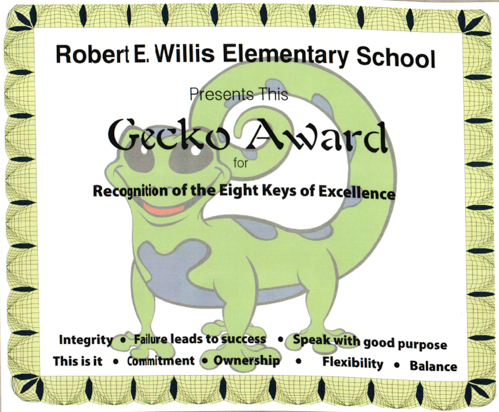 Once painted, the geckos are displayed throughout Willis's hallway. A store is set up for Willis student's to do their holiday shopping for their families (without mom and dads help). This is a twice a year event where Willis students have breakfast with their mom, dad, or someone special. Once a week Willis Runners get together to run before school. As students complete laps they move towards the various goals and by the end of the school year many have completed the distance of a marathon. It is Free for all Willis students and Willis families. Please wear running shoes, socks and dress accordingly for the weather. Recommend bringing water as well. May be canceled due to weather and field conditions. After students record their laps they will be lined up and taken thru the cafeteria for breakfast or they may continue to their class. Students may only leave the field if they are with an adult. Please add parents may not park on the grass. They may drop their children off at the field or park in the main parking lot. Spirit Nights is a fundraiser where Willis families eat at local restaurants (Chili's, and Chick-Fil-A) on specific night ... Spirit Night where part of the proceeds go back to Willis. Throughout the year we LOVE the staff, but for one week we dedicate showing our appreciation to the teachers and staff of Willis Elementary. Largest Willis fundraiser. Willis student, teachers, and staff walk to raise money for Willis. Based on the amount of money each student raises, they win valuable prizes like "no homework", "free ice cream", Willis Walk-A-Thon t-shirts ... And, the chance to get Mr. Stenger, Principal, to do something out of the ordinary like hang out on the roof and go up in a hot air balloon.